No one knows what 2017 will hold. But these growth stocks look like great ideas. There's plenty of uncertainty going into 2017, but that doesn't mean that long-term investors should change their strategies. Buying shares of good companies at reasonable prices and holding them for a long time is the key to investing success. And if those companies have exceptional growth potential, even better. We asked three of our contributors to each discuss a growth stock that looks enticing as we enter 2017. Here's why Wynn Resorts (NASDAQ:WYNN), Skechers (NYSE:SKX), and Zillow Group (NASDAQ:Z) (NASDAQ:ZG) should be on every growth investors' radar. Sean Williams (Wynn Resorts): Call it a bit of a gamble, but the growth stock that I believe should be on investors' radars this January is high-end casino and resort operator Wynn Resorts. 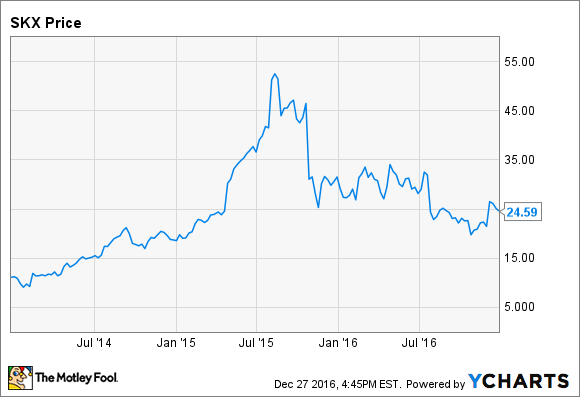 Shares of Wynn have done pretty well in 2016, but over the past three years Wynn's stock is down by roughly two-thirds. Wynn's struggled with weakening casino revenue in China, which is primarily a result of its slowing GDP growth, as well as concern in the U.S. that subpar GDP growth would affect its business in Las Vegas. However, based on the company's third-quarter earnings report, Wynn seems to have found its groove once again. In August, Wynn opened the Wynn Palace in Macau, a high-end casino and resort that currently boasts 100 new table games and will have 150 total in place by 2019. Wynn wound up netting $164.6 million in revenue during a partial Q3 from Wynn Palace. In 2017, with a full year of revenue from the Macau-based luxury hotel, Wynn's revenue could increase by around $900 million from 2016. Though we continue to see a steady decline in Macau-based revenue as China's elite adjust to the country's slightly slower growth environment, the allure of a new luxury hotel on the scene could more than offset the recent year-over-year casino revenue declines and the drop in revenue per available room (RevPAR) at Wynn Macau. Brightening economic prospects in the U.S. that include higher interest rates (meaning higher interest income for seniors), and a new high in the U.S. stock market, could brighten the outlook for gamblers in Las Vegas. We may already be seeing the benefits of that improved outlook in Wynn's top-line results. Room revenues in Las Vegas increased more than 9% in Q3 2016, while RevPAR grew by an impressive 6.6%. If traffic is once again headed Vegas's way, it's just a matter of time before Wynn sees improved results from its smaller contributing U.S. operations. According to Wall Street, Wynn has the potential to accelerate its EPS growth from around 10% in 2017 to perhaps 20%-25% annually by the end of the decade. To boot, investors also get a 2.2% yield for their troubles while they patiently wait for the Wynn Palace to work its magic in Macau. Wynn looks to be a solid growth play worthy of your consideration in January. Tim Green (Skechers): After its most recent earnings report, footwear company Skechers may not seem like much of a growth stock anymore. Revenue grew by 10.1% year over year during the third quarter, but the company's guidance for the fourth quarter calls for roughly flat sales. Skechers still expects its international wholesale and total retail businesses to produce growth, but an expected sales decline in its domestic wholesale business will weigh on the company's results. Skechers streak of incredible growth over the past few years was bound to end sooner or later, but I think the market is being a little too pessimistic. Analysts are expecting EPS of $1.64 this year, putting the stock price at 15 times earnings. The stock was significantly cheaper right after its disappointing third-quarter earnings report, but even at the current valuation, the market isn't pricing in much growth potential. Skechers is looking more like a value stock than a growth stock at this point, but if the company can return to growth in 2017, the stock could have a great year. The company's strong balance sheet, which features $665 million of cash and just $74.5 million of debt, could lead to either a dividend or a share buyback program next year. I would be surprised if Skechers doesn't return some cash to shareholders, especially with the stock so beaten down. Skechers isn't the scorching growth stock that it once was, but the market appears overly pessimistic. Investors looking for a nice combination of growth and value to start off the year need to look no further than Skechers. Steve Symington (Zillow Group): Shares of Zillow Group are up more than 60% year to date with only a few days left in 2016, including a 36% pop since I last singled it out as an intriguing growth stock to buy this past May. But I think these gains are only the beginning for the online real estate leader. Most recently in early November, Zillow continued its habit of trouncing Wall Street's expectations, setting a fresh company record with revenue up 35% year over year, to $224.6 million (well above guidance for $217 million to $220 million). Adjusted earnings before interest, taxes, depreciation and amortization more than doubled over the same period, to $59.5 million, above guidance for $48 million to $53 million. And the company swung to GAAP profitability with net income of $6.8 million, or $0.04 per share, up from a net loss of $26 million, or $0.15 per share in last year's Q3. On an adjusted (non-GAAP) basis, which excludes items like stock-based compensation and acquisition expenses, Zillow's earnings of $0.18 per share handily outpaced analysts' estimates of $0.13 per share. Zillow's growth is broad-based as well; Marketplaces revenue rose 45%, to $206.9 million (excluding Market Leader), including a 33% increase in Premier Agent revenue. Meanwhile, mortgages revenue increased 57%, to $19.8 million, and revenue from other up-and-coming businesses like dotloop, agent services, StreetEasy, Naked Apartments, and rentals nearly tripled year over year, to $28.8 million. Zillow CEO Spencer Rascoff elaborated that "with all of our marketplaces performing strongly, we expect to end 2016 in a strong position to continue executing on our strategic priorities." To be sure, Zillow's core business aims to take as much share of the estimated $12 billion that real estate agents spend annually to advertise their listings. Add to that the promising incremental opportunities created by its smaller complementary segments, and I think Zillow has plenty of room to rise from here.